Jonathan Schwartz teaches math, engineering, and computer-integrated manufacturing at Colfax High School. 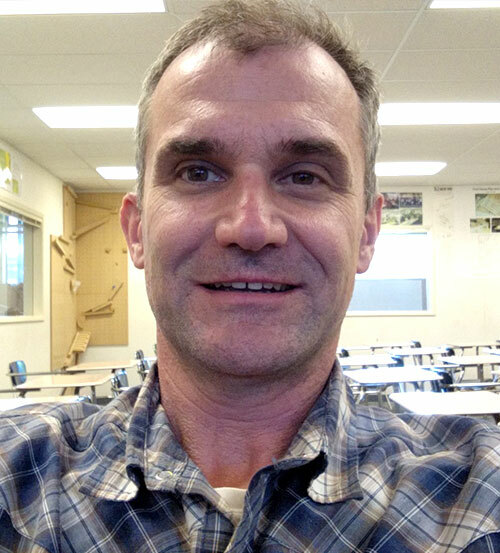 After years of owning his own construction company, he began teaching math at Colfax. When he learned that the woodshop teacher was retiring and the shop was in danger of closing, he took over the construction program because he knew the value of hands-on learning. When the drafting program faced the same fate, he took over those classes and created a new program that combined drafting, woodshop, and advanced manufacturing. Under his leadership, the program has flourished, and is now known as Pre-Engineering. Schwartz’s students use software to design wood projects, then build those projects with traditional shop tools, CNC equipment, 3D printers, and laser cutters. In this program, students start with an introduction to design and building, then complete an engineering class where they design wood products and build them in the shop. The third course is Computer Integrated Manufacturing, where students use computer controlled machines to design and build projects — again, all in wood. In their final capstone course, his students work with a mentor, pick a large project and spend the year building it. These classes articulate seamlessly with those offered at the local community college. Schwartz encourages his students to experiment, work with industry mentors, and present their projects and inventions to the larger world beyond their small town. Some of his students’ projects have been featured in Inventor’s Digest, American Woodworker magazine, Quirky.com, and presented at the Massachusetts Institute of Technology. Schwartz himself regularly creates new woodworking tools, one of which is currently being built here in the US, and shares the design and building process with his students. He also has a YouTube channel demonstrating project ideas for woodworking, CNC manufacturing, applied math, and best practices. In 2015, Schwartz’s Career and Technical Education department at Colfax High won the California School Boards Association Golden Bell Award for innovation.